I have owned dozens of different snow shovels over the years and about 20 years ago I finally found a shovel that worked for me and my crews. The shovel I am going to show you today is an updated version that adds one feature I didn’t know I needed until now. First though let me tell you a little about snow shovels. 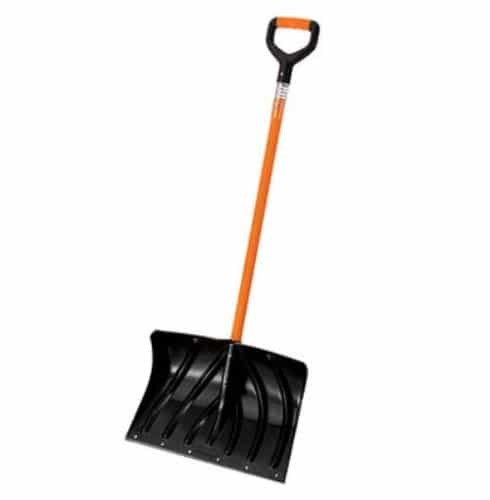 The old pusher style snow shovel has been around since the 40’s and is still very popular today because it is always the cheapest shovel hanging on the rack. You move snow by bending over and pushing the snow in front of you. It works well for light snows but when you get deep snow that you have to lift and snow out of the way you have to bend way over to get enough snow on the shovel. The second most popular style of shovel is the grain scoop. This shovel was originally designed to hold loose grain like corn, oats and soybeans and many companies have adapted it for snow. You can lift and throw snow well with a scoop but it has rounded edges and does not clean the pavement well. 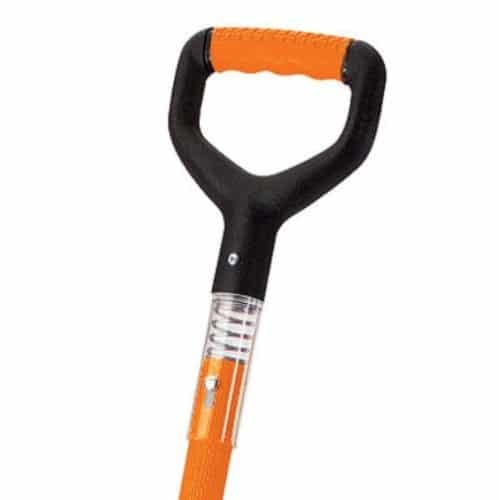 A full scoop of snow can be very heavy to throw and this type of shovel has been the cause of many heart attacks. 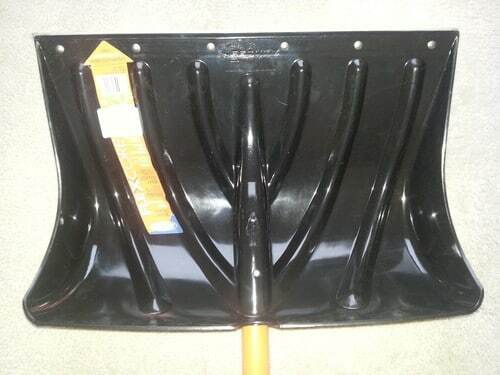 The third style of snow shovel is called a Pusher/Shovel and the Suncast 24 in. Steel Core Snow Pusher is one of the best. This shovel pushes well, throws well but what makes it so much better than other shovels is the top edge. The top edge is designed to roll the snow in front of you like a city snow plow. 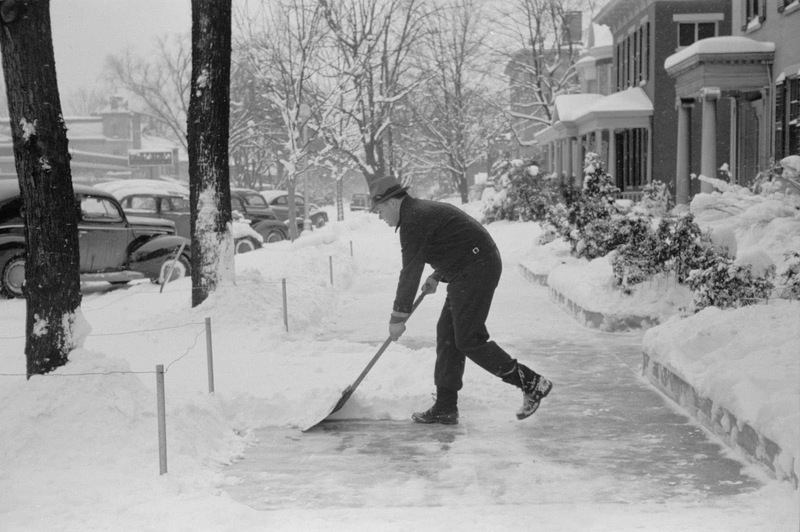 Cleaning 2 to 6 inches of snow off a sidewalk or drive requires have the time and effort over using the other two types of shovels. Most of the time you don’t have to lift and throw any snow. The shovels plows it off the are you are cleaning. The handle is just the right length. Long enough so you don’t have to bend to throw snow, but short enough so you can effectively push snow. When I sold the landscaping business I grabbed two of these off the trucks and 13 years later they are still going strong. One gets left outside by the backdoor to clean the patio and the other sets by the front door to clean the small areas the snowblower can’t get to. Both of them have set outside for six months at a time and even after 13 years they show no signs of ultraviolet degradation. There was only one thing I didn’t like about the shovels and this problem is fairly common with all snow shovels. When you are cleaning a sidewalk the front scraper tends to catch on every little piece of concrete that sticks up. After using it for a while my wrist and elbow would always hurt. The new Snowcast shock handle adds a shock absorber and eliminates the shock to your joints. When you hit something solid the spring compresses and helps your joints from feeling all of the shock. I practiced with one on my patio for yesterday and the spring absorbs the shocks well enough that I will be able to clean my whole patio now without my wrists and elbows crying out in pain. I found one at my local Sears store but online the only place that carries it so far is Amazon. Buy it now, before you need it this winter. Buy Here From Amazon with free shipping! The spring is in a place that does not affect the strength of the handle. The clear cover is strong and long enough that it won’t break. The pins that hold it all together are just as strong as the rest of the shovel. I am going to buy one and I expect it to last as long as the ones I now have. I know….there is always a better, faster, cheaper way of doing something. 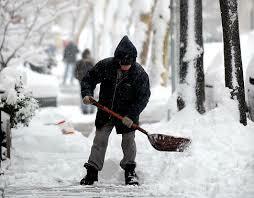 There are thousands of “the best” snow shovel on the market and every year there are a hundred more introduced. I feel this shovel is different. It takes a proven design, a snow pusher/shovel that works and makes it better! Buy one now and when you get my age your joints will thank you.